He’s only in high school, but Ryan Storm has already done so much incredible work to promote clean, sustainable eating and help preserve the environment. On his blog, Ry’s Ratings, he posts reviews of healthy, organic restaurants, chefs, shops, and products in the city. At 14, he made headlines in Toronto when he protested a misleading presentation promoting the health benefits of sugar to students. An advocate for good, real food, transparency in the food industry, and environmental conservation, Ryan is a truly inspiring kid! For his bar mitzvah, Ryan decided to partner with Shoresh for a mitzvah project. We spoke to Ryan about why he decided to give, and his experience at Bela Farm. Shoresh: Why did you decide to work with Shoresh for your bar mitzvah project? Ryan: The first time that I learned about Shoresh was when I went with my Year of Living Jewishly group from Beth Torah to Kavanah Garden on a field trip to help with the first seeding of the spring. I was completely inspired by Shoresh’s Executive Director, Risa Alyson Cooper, and wanted to do something more and go back again! My sister had also gone on a class field trip to Kavanah Garden with my mother a few years previously and had loved the combination of the organic garden and sense of community. It just made sense to me to support Shoresh for my bar mitzvah after understanding how much good Shoresh shares. 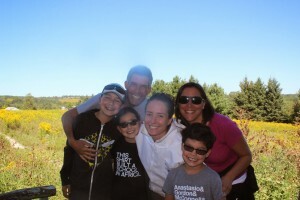 Shoresh: What inspired you to donate a portion of your bar mitzvah gift towards protecting pollinators? Why did you want to do this project specifically? Ryan: In the spirit of taking on new responsibility, and also staying true to my own values, I was very proud to be sharing my bar mitzvah gifts with Shoresh. Since Shoresh is working to build a more connected and ecologically sustainable Jewish community, I felt that it was a great organization to get involved with. I did a large school project about the bee collapse and learned that over the past years the bee colonies have become in huge danger, and it’s suspected that it’s due in large part to pesticide use in conventional farming. I knew that a donation to Shoresh would not only help plant a lot of native flowering plants to attract bees, birds and butterflies, but would support Shoresh’s own organic (pesticide-free) grounds, by pollinating their plants, and will also help our food system and our community in so many ways. 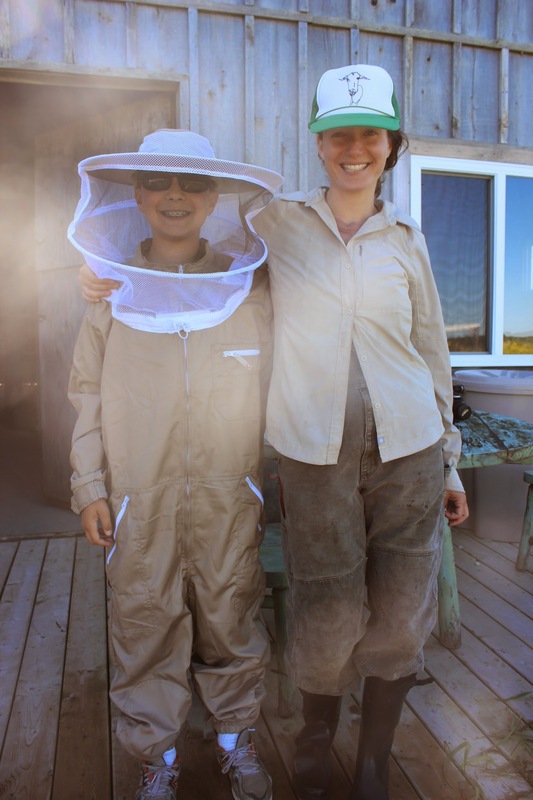 I really wanted to donate enough to buy a hive for Bela Farm, and was so happy to be able to do so because of my family and friends generosity. When I learned that Shoresh meant “root” in Hebrew –  a meaning that is significant in so many ways at this time in my life, highlighted by Rabbi Yossi Sapirman, made it easy to donate! Shoresh: Tell me about your experience working with the bees at Bela Farm. Ryan: I had no idea what to expect from a visit to Bela Farm, and our short visit turned into an entire day, and I wished we could have stayed for so much longer. We not only got to tour around, but suited up in full beekeeper gear, got to meet the bees and then also got to extract the honey, and be the first to use the Shoresh official honey extractor. It was an incredible day, and even my 7-year-old brother was engaged and excited almost the entire time. One of my best friends joined us and also was very excited to learn about the bees from Shoresh. I can’t wait to work on the farm again. Shoresh: Do you have any advice for other students who may be interested in doing an environmentally conscious project for their b’nai mitzvah? Ryan: I guess I have the same advice for everyone to just try to always get connected to your community. Sometimes, finding a problem in our world, is the best way to also find an organization working on the solution. That’s what my mother suggested doing, and after I did the school project on saving the bees, it almost was scary and seemed like too big of a problem to solve, but then learning what Shoresh was doing inspired me to think positively! I hope people realize that they can make a huge difference even if they are one small person! Click here to learn more about Shoresh tzedakah projects! Post by Danielle Klein. Danielle is a student at the University of Toronto. You can follow her on Twitter.